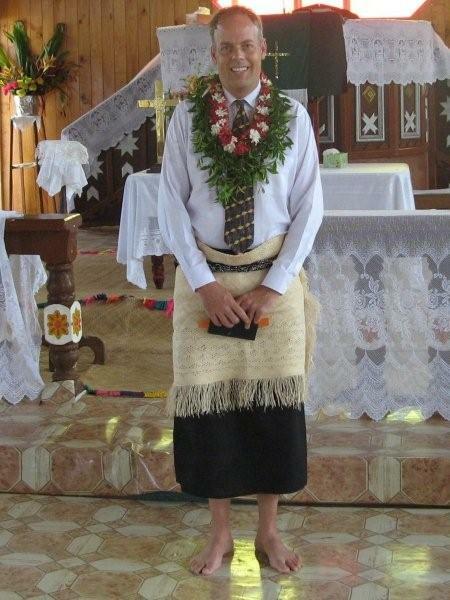 Tongans are known for giving speeches at just about every event. It’s very common for people to stand up and say what is on their mind at many different kinds of functions. Friday was fellow trainee Janice’s birthday. Her host parents invited the 11 of us who are living in Ta’anea to dinner. As we were eating, her host parents gave several very emotional speeches about how much they are going to miss all of us. Our language teacher also got up. This started the long process of saying good-bye to the people with whom we have lived for the past six weeks. For Janice, Shannon (another Ta’anea trainee) and me, we will be back and will certainly see our families again. But for the others, they may not be back as they will be living on other islands for the remainder of their Peace Corps service. On Saturday, the minister of the Wesleyan (Methodist) Church, asked several of us to participate in our final church service on Sunday. 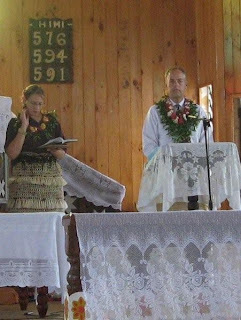 I was asked to lead the congregation in a Tongan hymn. Now for those of you who don’t know, singing is not exactly one of my strong points. And speaking Tongan, especially poetic Tongan is not a strong point either. However, unlike in the United States, when you lead a hymn here, you simply read the verse and the congregation sings it back to you. We sang three of the four verses of the song and it had some pretty big words. The sentence that I had the most difficult time with was “Kau ‘ofa ki he me’a kotoa Tukuingata ke ‘aonga neongo pe ho hai.” In Tongan, ng is considered one letter and I always seem to struggle with the pronunciation of words with ng. This sentence has three words that use ng so it was pretty tough. I know I butchered it when I read it aloud but I just kept going. As far as I know I didn’t say anything inappropriate instead. The sentence means something like try to be helpful in everything you do, but that is not an exact translation. Sunday night, the good-byes continued with the village throwing us a two-hour going away ceremony. The youth did a number of dances for us. 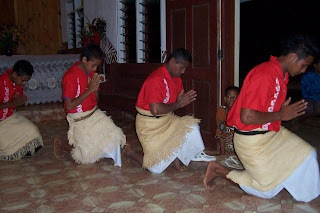 The men from the Kava circle sang and at the end everyone sang (in English) “We wish you a Merry Christmas and a Happy New Year.” It was a very nice send-off and I don’t any of us were really expecting it. We didn’t even find out about it until Sunday morning when they told us to be there at 7pm. We all arrived and found out that each of us was expected to give a speech. 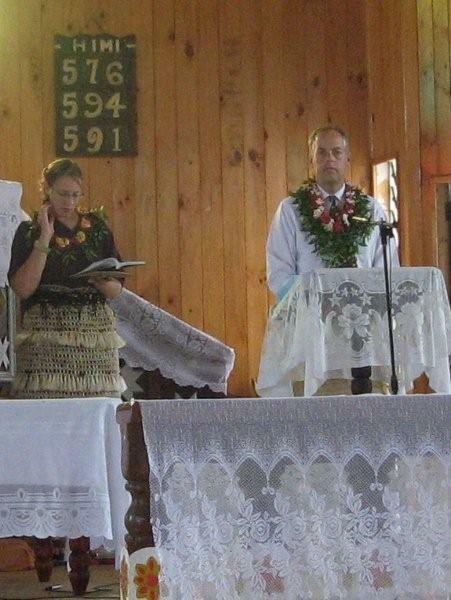 I really wanted to thank everyone but I had trouble remembering all the words I wanted to say in Tongan, so I quickly said hello in Tongan, switched to English and then wrapped up at the end in Tongan. Probably only spoke for about a minute but it seemed much longer trying to remember all the Tongan words. A couple of the trainees had found out that they were going to have to give a speech and had written it out in advance. I didn’t know, so I just winged it. Monday, my host family prepared an awesome good-bye dinner with some of my favorites, especially the fish curry and the chicken curry. They topped it off with Cookies and Cream Ice Cream. It was a nice evening and it also gave me a chance to thank them one last time for all they have done for me. This time, I wrote it down in Tongan so I could get it right and they seemed to understand me. I look forward to seeing them again when I return to Vava’u in a few months. Tuesday morning we left early and my host Mom and Sister wanted to drive me to the airport to personally see me off. They waited with us until the plane finally arrived. They both cried as I was leaving and I gave them both really long hugs. That’s not exactly culturally appropriate here, but I wanted to do it and it seemed to be fine. The flight was on a very small plane. To get on the plane, we each had to stand on a scale with our carry on bags. We were then assigned seats based on weight so the plane would be weight balanced and to make sure we would not be over the planes maximum weight allowance. We were ach allowed a maximum of 22 pounds of carryon and checked luggage. The rest of the bags are being put on a boat and will arrive in a few days. When it came time to board, we talked directly to the plane. No security check-point, no airline official who announced the flight and no rules about walking onto the runway. We got on board and there were no flight attendants and the entire flight we flew with the cabin door open and because I was in the second row, I could clearly see the gauges in the cockpit. The flight was actually pretty amazing. 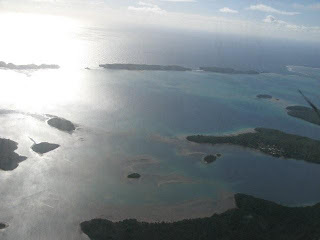 We got to see Vava’u for the first time and flew over our home village of Ta’anea. It was incredible to see all of the islands in the chain and to finally see all of the island that has been our home for the past six weeks. It was a beautiful day and we flew at a fairly low altitude so it was pretty easy to see. After about 30 minutes, we flew over the Ha’apia Island group and got to see one of the active Volcano’s on the west side of the plane. I tried to take a picture, but there were clouds in front of it and it didn’t turn out. 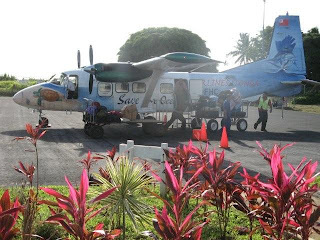 We finally landed in Tongatapu, right on schedule at 9am. We will complete our training here and will become official Peace Corps Volunteers on December 12th. Wednesday morning, seven of the guys played in a basketball tournament, losing one game and winning one game. I surprised myself, scoring the very first time I touched the ball. Unfortunately it was the only score I made after that. We lost 10 to 8 to a group of Tongans. (Baskets count as one point and what we would consider a three pointer, is a two pointer here.) Our fellow trainees did a great job cheering us on. The second game we won against a Chinese team but they were really tough to keep up with and moved a lot faster than the Tongans. After the game (and a shower), I got to go to the main office of the Tonga Development Bank, where I’ll be working for the next two months. I met with some of the bank executives and the Peace Corps volunteer who currently works at the main branch. They put together a great overview of the bank for me and gave me a tour. As I was watching the PowerPoint presentation they did for me, I realized that I will soon be stepping back into the corporate world that I left May 11th. It’s going to be a completely different experience of course but it brought back and it was great fun to sit in there and learn about their business strategy, financial condition, market share, etc. My first day will December 17th and I’ll have three weekdays off at Christmas and three weekdays off at New Years. In Tongan, there are many words that have the same meaning and you just have to figure out the context. When we introduce ourselves, we are encouraged to give some of our background. I generally say in Tongan that I managed a TV News department. The word for manage is fakalele. However the same word also means diarrhea. That means I say “I managed a TV News Department or “I diarrhea a TV News Department”. I can already hear my former co-workers laughing and saying that managing and diarrhea have a lot in common. I have maintained the same weight as when I arrived, which was a tad heavy. Some guys in our group have lost as much as 30 pounds.